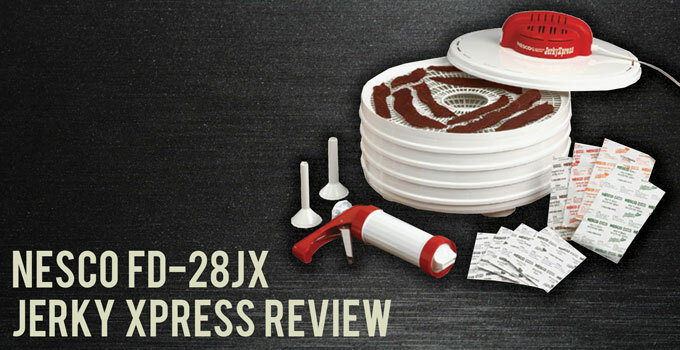 The name says it all for the Nesco FD-28JX Jerky Xpress, which is built to produce meat jerky in express-food fashion, or at least as rapidly as is feasible. Choosing this dehydrator comes down to an obvious question: Do you want to make jerky quickly? The low cost, compact size, and preset temperature of this machine allow it to produce jerky with the least amount of hassle. People who need to rely on dehydrating large stores of food or who hope to dehydrate produce along with their meat should probably consider looking at other options for now. Reviews for this beef jerky dehydrator are consistently brief. Some highlight its small size, but most just confirm that the machine performs its job satisfactorily. Getting down to the nitty gritty, some customers affirm that the dehydrator is absolutely worth every penny and others offer high praise for the jerky gun. There are a handful of negative reviews that bring up potentially valid issues with the dehydrator. For starters, its low price likely means the drying trays are made out of thin and cheaper quality material. A few reviewers have complained about the plastic material sagging too much due to the weight of the meat. A few other users did not appreciate the loud sound the fan makes when the machine is running. Such a loud noise might seem unwarranted considering how small the machine itself is. All things considered, it has an overall score of 4.2 out of 5 stars in more than 500 Amazon customer reviews. What Does the Nesco FD-28JX Jerky Xpress Come With? In line with its express theme, this dehydrator is loaded with just four circular drying trays, though up to seven drying trays can be docked in the machine at the same time. This addition results in up to seven square feet of drying space and approximately seven pounds of dehydrated meat. The trays are not dishwasher safe, however, so manual washing is in order. Conveniently, you can detach the top cover for easier access when cleaning the inside of the machine. A useful tool for making jerky is a jerky kit, which is included along with the machine. The jerky kit consists of a jerky gun, three types of gun tips for varied expulsion, and several packets containing different jerky flavoring. The tools are easy to use: you simply need to load the gun with meat and spices, attach your tip of choice, and fire the mixture onto a drying tray. Unlike most dehydrators that are built to dehydrate any type of food, this one is intended for use in dehydrating meat in order to make jerky, hence the complimentary jerky kit. A nice touch is that the dehydrator also includes a free one-year warranty. The power behind this dehydrator is a fan-driven powerhead that rests at the top of the machine. Once activated, the fan blows heat from the top of the machine down through the rest of the drying shelves. The small size of the machine guarantees the food inside it will get cooked well enough, but the lack of a lateral airflow technology probably means the food will not dry as evenly as it might with other dehydrators. In this case, food on the top shelf is liable to be ready before food on the bottom shelf. Although, the food on each individual layer should dehydrate at the same speed. A compact size also limits the heating process in terms of power and timing. The 350-watt powerhead is restricted to a factory setting of 165 ºF. This is great for dehydrating meat, but much too hot to adequately dehydrate fruits and vegetables. The preset thermostat can effectively heat about one pound of meat per drying tray. This might not be the biggest concern for meat lovers, and could be more practical in some ways. If you were only planning on making jerky anyway, automatically setting the temperature to 165ºF would actually simplify the process. All you would have to do after setting the meat inside the machine would be to flip a switch. The machine would take care of all the rest. How Large is the Nesco FD-28JX Jerky Xpress? Easily fitting in the smallest of cooking spaces, this dehydrator is perfect for people who are concerned about limited working space, or are planning on taking their dehydrator for a trip. Its measurements are 14 by 9 by 14 inches, and it weighs a mere 5.5 pounds. The small size of the machine might be one of its most redeeming qualities. Whereas many dehydrators are bulky and take up a considerable amount of cooking area (some dehydrators are even too big to safely stand on top of the counter), the Jerky Xpress can fit just about anywhere. There are many positive implications here, including fast preparation, simple cleaning, location flexibility, and easy storage. Taking those points into consideration, this dehydrator is a great match for people who view themselves as more casual dehydrators, and who might let their friends and family borrow it from time to time. In lieu of its small size, the dehydrator is a good bet for tight spaces. It is only available in one design: all white except for a red-colored heating unit. Subjectively speaking, the design is not quite as slick or beautiful as other commercial dehydrators. Despite only running on 350 watts of power, the heating unit is said to be quite noisy. This could be a consequence of the design of the motor or the vibrations of the surrounding plastic material. If comfort is a priority for you, the boisterous fan may be a deal breaker. Deciding on whether or not to purchase the Nesco FD-28JX Jerky Xpress is pretty easy. It is cheaper and smaller than most other commercial dehydrators, and it is primed for making small slices of jerky and little else. Its mostly positive reviews indicate that customers likely understood what they were getting before ordering the dehydrator. The machine pretty much does exactly what it claims to be able to do. Even if the fan is little noisier than expected or the drying takes a tad longer than desired, its low price still makes the dehydrator well worth it. 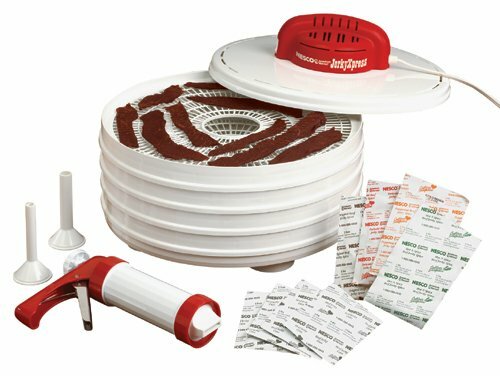 The bottom line is that you should try this dehydrator to prepare jerky on a budget. It could be the best dehydrator for jerky among all others in this price range.